Deanna McCusker | Wow! Use your mobile device when it’s 30 below! Wow! Use your mobile device when it’s 30 below! It’s always fun when popular products spawn whole new categories of must have items. This year we saw slim sleeves for the Mac Air, ever smaller purses designed specifically for tablets, and my personal favorite – gloves with contact pads for use with a touch device. What a great idea! My husband promptly bought me a pair for Christmas and I promptly donned them the next day to drive to the mall to return other, not so innovative gifts. Design Lesson #1 – test the new feature with all use cases. The contact pads had to be positioned precisely to work. And gestures like zooming in, which generally use the side of the thumb and forefinger didn’t work well at all. 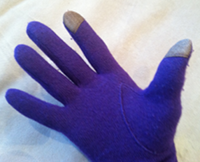 Design Lesson #2 – don’t forget to keep the other great features of low-tech gloves like non-slip palm surfaces. It was hard to drive with these gloves because I couldn’t get a good grip on the steering wheel. Even worse, it was impossible to grasp my sleek iPhone.